UIDAI Career Job Opening Recruitment 2017-2018 for Various Deputy Director Posts, Jobs Application Form Download at (www.uidai.gov.in). The Interested candidates will have to before Walk in Interview carefully reading the advertisement regarding the process of examinations and interview, Qualification, Offline registration processes, payment of prescribed application fee/intimation charges Walk in Date, Time, Venue etc are Given Below. 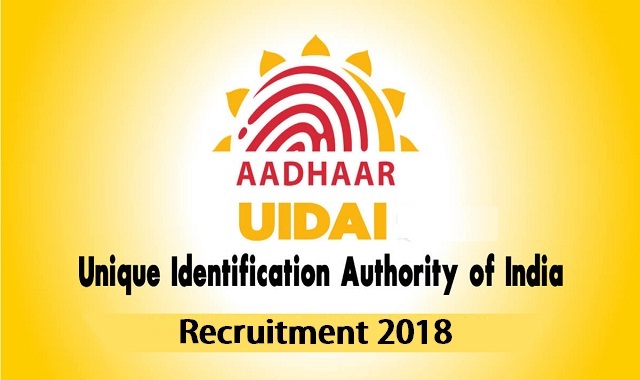 UIDAI Hiring for Deputy Director @ Bangalore - Apply Online. Unique identification project was initially conceived by the Planning Commission as an initiative that would provide identification for each resident across the country and would be used primarily as the basis for efficient delivery of welfare services. It would also act as a tool for effective monitoring of various programs and schemes of the Government. a) The concept of a unique identification was first discussed and worked upon since 2006 when administrative approval for the project –"Unique ID for Below Poverty Line (BPL) families" was given on 03 March 2006 by the Department of Information Technology, Ministry of Communications and Information Technology. The last date for receipt of applications complete in all respect is 15th June, 2018.